It’s easy to forget that writer-director David Lowery, the man behind such atmospheric and lyrical films such as Ain’t Them Bodies Saints and A Ghost Story also made the heartwarming Pete's Dragon; but his latest film is similarly warm and enjoyable. Reuniting with two former collaborators, Robert Redford and Casey Affleck, he brings us the incredible true story of lovable con artist Forrest Tucker. "Robert Redford has never been better." Tucker (Redford) spent decades robbing banks, getting arrested, breaking out of prison, and robbing more banks. The film opens in 1981 when Tucker, now in his mid-60s, is in the midst of a crime spree across Texas and the Midwest. His approach is very simple: he goes into small, locally run institutions, tells them he has a gun, and very politely asks them for their money. Along the way, he attracts the interest of a Texas detective, John Hunt (Casey Affleck) who is fascinated by Tucker but determined to bring him to justice. Despite his rebellious streak, the veteran outlaw falls for a local widow, Jewel (the wonderful Sissy Spacek), who despite not being quite sure if he’s kidding about being a thief, really enjoys his company. With a reputation for being gentlemanly during his heists, Tucker (who died in 2004 at the age of 83) wasn’t so much a conman or a hustler, but more a man with a restless spirit. Redford has never been better – blending charm and guilt like no one else can. Paying homage to some of the great films of the 1970s not only with its cast but in its look and feel, The Old Man & The Gun tackles serious themes of ageing and regret with a huge heart and sense of fun, and the result is pure delight. 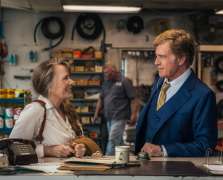 And if Redford’s claims that he has retired from acting for good are to be believed, then this film is the most charming way to say goodbye to an acting legend.